Book Combos are now available to help the electrician prepare for the electrical licensing exam and save money. These books include questions similar to those asked in the electrical licensing examination. Answers are also included in the back of the workbooks. 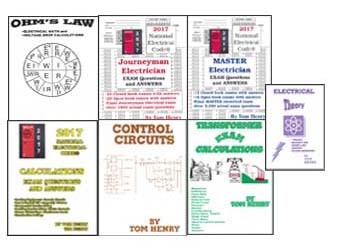 Tom Henry's electrical books are used by many apprenticeship programs, schools and electricians. Journeyman Exam Book Combos - These book sets are designed to prepare electricians for the journeyman electrical licensing exam. Workbooks include questions and answers. These books are also included in the master combos. Available in 2017, 2014, 2011, and 2008 Code. Master Exam Book Combos - These books help electricians prepare for the masters electrical licensing exam. Designed to advance the journeyman to the master level. Available in 2017, 2014, 2011, and 2008 Code. "Now you can SEE the Code in pictures of the Electrician's everyday applications." 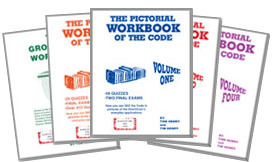 "Excellent study guides for vocational schools, electricians, apprenticeship programs and even for the electrical engineer that had zero hours of code study at the University." Math Book Combo Without understanding basic math operations, you cannot hope to pass an electrical exam or be successful in the construction industry. This combo of math books will teach you what you need to know before taking an electrical exam. Over 200 math questions explained in full detail! This package includes the The Math workbook, and the Math review workbook. Ammunition combo - designed to help you find necessary articles and references quickly and successfully. To successfully pass the electrical licensing exam, the electrician must answer the correct amount of questions in the right amount of time. Code book packages include a National Electrical Code (NEC) Looseleaf Code book and the ammunition combo. Tabs are installed in the Complete Plus, Ultimate and Elite packages. The Industrial Combo is an excellent combo for the Industrial Electrician! This package includes the Industrial Electrician Workbook, The Control Circuits Workbook, Electric Motors Workbook, and Transformer Exam Calculations. Save $$$ ONE BOOK FREE!!! The Inspection Book Combo is an excellent combo for an Electrical Inspector or an Electrician who wants to further their knowledge in the electrical field. 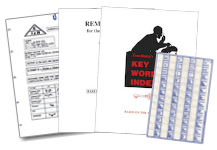 This package includes the Electrical Inspection Workbook along with 2 Dvd's and the Home Inspection Workbook. Special 3 - Fire Book Combo With the many electrical accidents today lawyers, are looking for licensed master electricians in many cities throughout the USA for personal injury cases. This package includes the How to stop an Electrical Fire before it starts, the Fire Safety book, and the Electrical Fire Investigator book. Special Troubleshooting Combo Save $$$ when purchasing these excellent reference books together by Tom Henry. This package includes The Electrician's Workbook along with the Troubleshooting Electrical Circuits Workbook. The Exam Combo is an excellent way to start! For the electrician that has never taken an exam. This package includes Tom Henry's Audio CD's and 65 Closed Book Questions, How to Pass the Electrical Exam Workbook, and Dictionary for the Electrician. Theory and Ohm's Law Combo - An excellent refresher for the troublesome part of the exam. This book combo includes the Ohm's Law-Theory DVD or video, Ohm's Law Electrical Math and Voltage Drop Workbook, Electrical Theory book and Electrical History book. Conduit Bending Program - Includes an Award Winning Video, The Conduit Bending Workbook and pocket sized charts. Learn where to place the pencil mark, which direction to make bend, how to allow for the shrinkage amount and calculate it into the bend and more. Special! Grounding and Control Package - Includes Tom Henry's Grounding DVD/Video and Workbook and the Control Circuits Workbook and DVD/Video at a discounted price. Tom Henry's 3 Book Combo- Tom Henry's special combo includes the Closed Book Review, Signs, Stories and Smiles and the Electrician's Pictorial Dictionary.